Chemical Defenses of Arthropods charts the significant progress in the study of chemical defenses in arthropods, a rapidly expanding area of chemical ecology. The book groups the defensive compounds secreted by arthropods based on their main functionalities and sequentially lists them according to their carbon numbers. Organized into 19 chapters, this volume begins with an overview of the defensive exudates of arthropods and how arthropods have exploited these compounds to deter the ubiquitous and omnipresent predators around them. The next chapters introduce the reader to the defensive compounds produced in the exocrine glands of arthropods, ranging from alcohols and ketones to hydrocarbons, carboxylic acids, esters, 1,4-quinones and hydroquinones, lactones, phenols, steroids, and proteinaceous venoms. The book also discusses the taxonomic value of arthropod defensive compounds, with emphasis on factors affecting the composition of defensive secretions and taxonomic correlations that utilize them. Later chapters focus on arthropod biosynthesis of exocrine compounds, how insects tolerate the presence of plant toxins in their diets, and identified defensive compounds in arthropods. 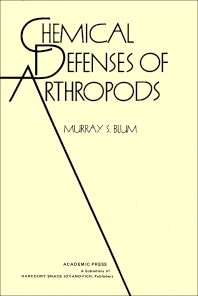 The book concludes with an analysis of the properties and characteristic distributions of arthropod natural products, along with their adaptiveness as defensive agents. This book is a valuable resource for biologists and chemists. II. Defensive Allomones as Pheromones or Cryptic "Pheromones"